South : Wumen or the Official South Gate of the Palace Museum and Forbidden City Grounds with beyond it the Zhongshan Park with behind it and to the North the connected Sun Yat-Sen Park (so named after the " Father of the Revolution " and 1st President o/t 1st Republic of China) and its Sun Yat-Sen Shrine Hall (Bai Dian). In the South-East Corner of Outer Palace (the Outer Imperial City) lies todays the Park of the Peoples Culture, the Hutong on both sides adjacent Nanchizi Dajie' and the Affiliate Site of The Imperial Palace, the Imperial Library Vault (with inside an annex Hall todays Wanfung Modern Art Gallery). The most Southern Gate depicted is Tian An Men ( or the Gate of Heavenly Peace ) that stands at the North of Tian An Men Square. In the Past there was another Gate halfway between TiananMen and QianMen, giving access to the Outer Imperial City. Outside of this was the Realm of the Chinese Commoner. The entire map area is locally referred to as Forbidden City or GuGong. The Palace Grounds proper, constructed in the Ming Dynasty, are known as the Palace Museum, a United Nations World Heritage Site and the largest preserved group of wooden buildings in the World. 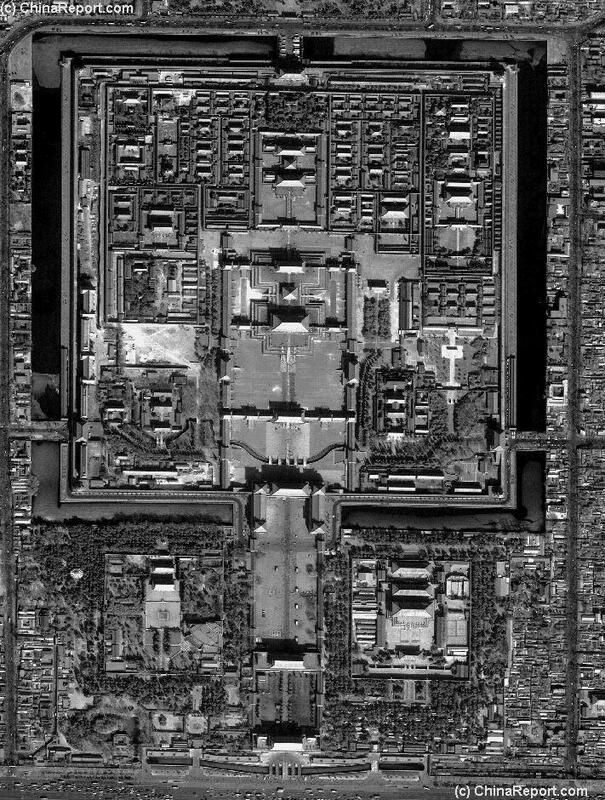 The year 2007 Official schematic Map of The Forbidden City, by The Palace Museum. With links to further information on the various sections. Since new sections have been opened to the public as one will find when browsing the various available Maps of the Palace Museum. 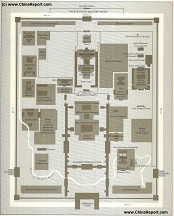 Historic 1960's Era Unofficial schematic Map of The Forbidden City aka The Palace Museum complementary to the oficial Palace Museum Schematic Map and revealing various former functions of sections and Halls plus location there of. Follow links to additionnal information on each site.